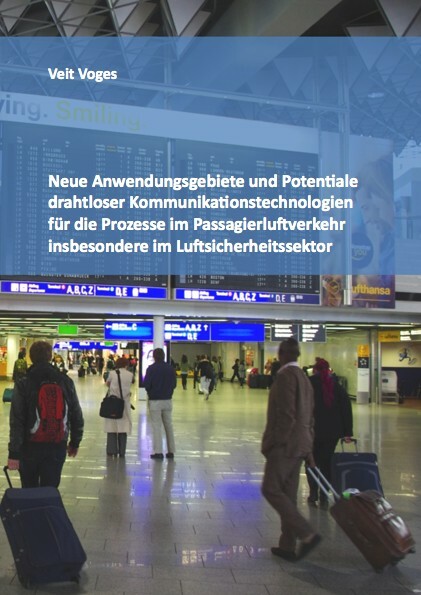 This dissertation analyses several aspects of the integration of procedural and security relevant information in passenger air transport processes by utilizing Near Field Communication (NFC). The constant look-out for efficiency gains and the adaptation to new technological developments have to be the central objectives for all relevant stakeholders in air transportation, such as airlines, airports and authorities, to realize the projected growth rates and reach the aspired profitability levels. The optimization of passenger processes within the terminal plays a key role in this context. The objective of this dissertation is to discuss the effects in the process flow in passenger air transport by exploring several applications of wireless communication technologies. Due to its inherent characteristics, NFC has been chosen as the suitable example to support the information exchange along the process chain of departure and arrival flow. Furthermore the integration fosters new risk-based security strategies and contributes to an overall improvement in risk analysis and situational awareness. Commercial services, such as ticketing or payment and security related process steps can be aligned. Key benefits of the NFC technology could be identified that follow the objective of an overall seamless process and likely prove to be accepted by passengers. Using smartphones as the implementation form, perceived benefits and performance expectations could empirically be found in a passenger acceptance survey. The different process steps have been analyzed with regard to simplifying interfaces, introducing new services as well as the overall aviation security strategy. Several drivers can be attributed to the expected development of NFC in passenger air transport such as industry-wide standardization, support by global associations, certainty of return on investment in proven business models, and realization of network effects towards other industries. For the central research part, the introduction of an NFC device functioning as enabler for all necessary process steps and services of a passenger’s air travel has been modeled on a conceptual level and simulated using the process simulation software Arena. Together with an analysis of the survey of acceptance by passengers and expert interviews, the financial perspectives and the implementation challenges have been discussed.